Phoenix Chiropractor News – Meiner’s disease is a disorder of the inner ear which causes vertigo, a condition which you causes you to feel as if you’re spinning. It is accompanied by undulating hearing loss and a ringing sound in the affected ear and can eventually lead to permanent loss of hearing. New Chiropractic treatment shows marked improvement. Symptoms of Meiner’s disease include a ringing in the ear (tinnitus), accompanied by the feeling of pressure in your ear. Generally, Meniere’s Disease affects only one ear but in some cases, can include both ears. Meniere’s Disease episodes generally come and go but often become permanent if not treated. Treatment is available with Dr. Anthony Montoya, Phoenix Chiropractor, serving all of Arizona. Meniere’s disease usually starts between the ages of 20 and 50 but can occur at any age. Various treatments are available to relieve symptoms and minimize long-terms effects on your life. 615,000 people in the United States have Meniere’s disease according to The National Institute on Deafness and Other Communication Disorders. Contact Phoenix Chiropractor, Upper Cervical Chiropractic of Arizona for Treatment of Meniere’s Disease in Arizona. Meniere’s Disease is a chronic (long-term) disease, but treatments and lifestyle changes can help to ease the symptoms. Many people diagnosed with Meniere’s Disease will go into remission within a few years after their diagnosis. The cause of Meniere’s Disease isn’t known, but scientists believe it’s caused by changes in the fluid in tubes of the inner ear. 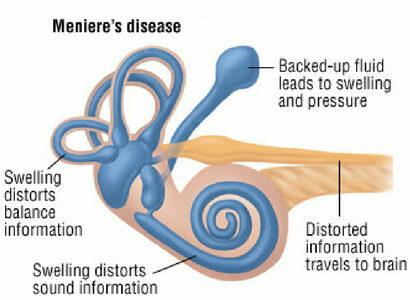 Meniere’s Disease can also cause severe dizziness and a roaring sound within your ears referred to as tinnitus. Attacks of dizziness may come on suddenly or after a short period of tinnitus or muffled hearing. Some people have single attacks of dizziness once in a while. Others may have many attacks close together over several days. Some people with Meniere’s Disease can have attacks so bad, they lose their balance and fall. 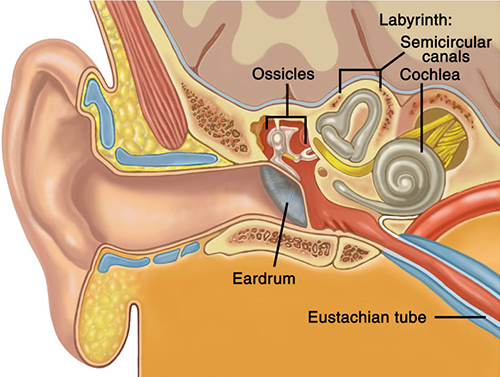 Although research is still being conducted, Doctors believe the cause of Meiner’s Disease is due fluid levels in the canals of your inner ear and it is diagnosed based on a physical exam and the patient’s symptoms. The degree of hearing loss can be determined by a hearing test. Chiropractic treatment can control dizziness in conjunction with limiting salt intake and diet. 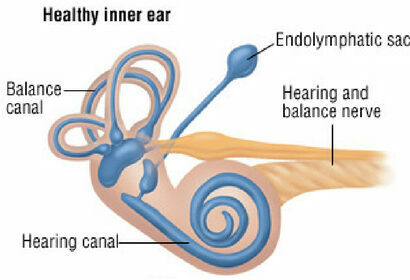 Medical devices are also available which are worn on the outer ear delivering air pulses to the middle ear. Severe cases may require surgery. Idiopathic endolymphatic hydrops is another name for Meiner’s Disease which is one of the most common causes of dizziness originating in the inner ear. Your Chiropractor will take a history of the frequency, duration, and severity of your attacks along with the degree of hearing loss. After examination, treatment is assessed. A hearing test typically indicates a sensory type of hearing loss in the affected ear and speech discrimination (the patient’s ability to distinguish between words like sit and fit) which is often diminished in the affected ear. An ENG (electronystagmogram) may be performed to evaluate balance function. During this test the patient sits in a darkened room and eye movements are recorded as warm and cool water or air are gently introduced into each ear canal. Since the eyes and ears work in coordination through the nervous system, measurement of eye movements can be used to test the balance system. In about 50 percent of patients, the balance function is reduced in the affected ear. Rotational or balance platform testing may also be performed to evaluate the balance system. Electrocochleography (ECoG) may indicate increased inner ear fluid pressure in some cases of Meiner’s disease. Lie flat and still and focus on an unmoving object. Often people fall asleep while lying down and feel better when they awaken. Contact Dr. Anthony Montoya at 602 954-2447 concerning Phoenix Meniere’s Disease. Avoid stress and excess salt ingestion, caffeine, smoking, and alcohol. Get regular sleep and eat properly. Remain physically active while avoiding excessive fatigue. Although there is no cure for Meniere’s disease, the attacks of vertigo can be controlled in nearly all cases. Doctor Anthony Montoya, Arizona Chiropractor offers Chiropractic services in Phoenix, Arcadia, Scottsdale, Tempe and all Arizona cities.